At Falcon, we understand that the safety of your family and home are of the utmost importance. We have thoroughly researched and sourced the security systems for our products to ensure that your home remains safe and secure. The locking system in our windows features a central deadlock, bi-directional bolts and roller cams. In total, there are 5 lock points throughout the window frame making it almost impossible to penetrate offering protection from would-be intruders. Our windows are designed to meet the strict ‘Secured by Design’ requirements, an initiative run by the police to reduce crime throughout the UK. Components featured in our windows are rigorously tested and assessed by the British Standards Institution and are certified with BSI Kitemark. 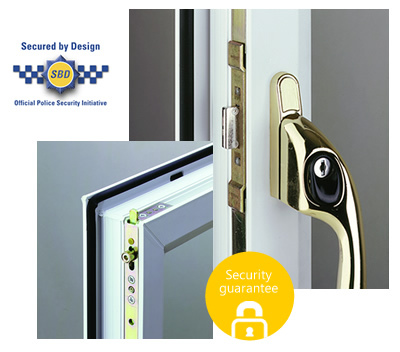 Our doors feature a sophisticated locking system that meets the ‘Secured by Design’ standards to keep your home safe. The multi-point locking system features a robust lock designed to reduce the risk of jamming, anti-lift bolts to prevent the door lock from being dislodged, and pre-compression rollers that are corrosion resistant. Due to this locking system, our doors can withstand up to 1.5 tons of pressure, which is roughly the size of a Ford Focus. Many doors offer other features including anti-pick, anti-drill and anti-snap locks for increased protection and peace of mind. *Please note: a detailed police report must be provided to fulfil the security guarantee.